In early spring 2011, CREC and Dungannon Intermediate School teamed up on a pilot worm bin project. Anna Hess and Mark Hamilton spearheaded the project, building the worm bin and buying worms and supplies. Staff at Dungannon Intermediate School were extremely helpful, teaching students to separate food waste from plastic and then storing the food scraps for weekly pickup. Between February 19 and April 27, the worm bin project saved 1,226 pounds of food waste from the landfill. 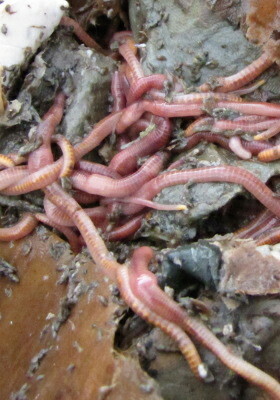 Unfortunately, the experiment was ultimately a failure for an unexpected reason --- the worms wouldn't eat the scraps! Worms love most food scraps, but they couldn't digest much of the processed, starchy foods that dominated the school's trash cans. For more information on the project, read the plan, the initial letter to the school, how to weigh several weeks of scraps to get an idea of the school's average output, calculating how many worms we'd need, buying worms locally, building a large worm bin, filling the worm bin, feeding the worms, weekly maintenance, initial success after one month, and eventual reasons for failure.